It's easy to look at these shiny Florsheim FS2005 Men's Black Steel Toe Slip-On ESD Oxford Shoes and think they're made for soft guys. You know the type: the ones who valet park all the time so they don't have to walk, and freak out if rain touches their fancy shoe ... (see full details) (see specifications) #FLSFS2005. It's easy to look at these shiny Florsheim FS2005 Men's Black Steel Toe Slip-On ESD Oxford Shoes and think they're made for soft guys. You know the type: the ones who valet park all the time so they don't have to walk, and freak out if rain touches their fancy shoes. But these Oxford shoes only look fancy. They're styled to perform like tough work shoes, and that's just what they do. The smooth, sleek uppers are certainly shiny and handsome. But all that shiny black beauty is leather, stern stuff that cleans easily and withstands wear while you're in these Florsheim shoes. Just wipe leather down to clean it off. It's weather-repellent and ready to go. There's no exposed metal on the uppers because why mess up the perfection of the material? The slip-on design of these steel toe shoes is made for you to slide your feet in with ease. Once you get in there, you're going to feel the plushy comfort of microfiber suede. Man-made microfiber can be made to feel like another material, suede in this case, but it's hard-wearing and strong. EVA foam inserts keep your feet cushioned and softened. The comfort heel gel is integrated into the outsoles to create a shock-absorbent pocket right beneath your steeping strike zone. Remove these inserts whenever you like for cleaning and airing out. The outsoles are made in a dual-density, two-layer design to give you dual layers of shock-resistance. The rubber soles of these safety toe shoes are slip-resistant and tough on the bottom. The midsole is another layer of EVA foam. That’s two levels of soft support. That's not all. The soles meet ESD requirements. That means they're electro-static dissipative. In other words, they won't collect static energy that can be damaging to electronic tools and equipment. Steel toes put a cap on the work-ready design. The steel toe caps meet ASTM F2413 standards for impact-resistance an compression-absorbance in the workplace. They deflect and absorb the pain of falling objects, so your real toes don't have to. We know these Florsheim FS2005 Men's Black Steel Toe Slip-On ESD Oxford Shoes look fancy. But we also know that they're going to work for you during a tough workday. I have to go between office meetings and a RO/RO ship every day. 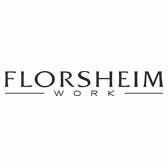 Thus this quality shoes for Florsheim are ideal for that office look but still maintain the safety standard necessary. The shoes definitely preserve my professional appearance and allow me to maintain the safety culture I require aboard the vessel. I would certainly recommend these shoes to any other professional not just on the basis of the steel toes but they also stand up to the pounding I put on them every day. Shoes looked great and fit well when I received them. I work in Automotive Manufacturing over a Welding and Stamping department. In about 4 months the shiny part started peeling off of the shoe and the soles where coming unglued from the uppers. I thought these were leather shoes and not patent leather... The cutting oil from the stamping operations caused them to start peeling and look pretty rough. Soon after, they just came apart on me. I am in a lot of different environments and have always been pretty rough on shoes at work but these failed really quickly. I will not purchase again. Professional busines appearance for those situations that require steel toed shoes but more of a dress look. Slip-on fits snug at opening so they do not slip off easily like loafers (a safety plus). Great arch support and gel inserts help keep feet comfortable while standing/walking for hours during work day. Finish holds up well and cleans easily. I have yet to have to apply any polish after one week in varied conditions (mostly dirt/dust in industrial facillities and construction sites. I would recommend these shoes to other professionals wanting to maintain dress appearance where stell toed shoes are required. Very pleased with these shoes. I do shop-floor consulting and after getting hounded for months about my more traditional looking shoes when speaking engagements, I purchased these shoes. o Lasted about a year with moderate ( daily ~3 weeks/month) use. Expect to replace these in about a year as the patent leather will start cracking at the creases and the soles just started to delam. This type of shoe is exactly what I was looking for. It is a steel-toe safety shoe that I can go from a client meeting straight to the plant floor. It has a sharp look and good fit, especially for my wide feet. They run true to size and width. They are also comfortable enough to wear all day long! Florsheim Shoes: Men's FS2005 Steel Toe ESD Slip On Oxford Shoes is being added to your cart.